"MARY KNOWS THE LAKE....AND HER WORK IS IMPRESSIVE...." This is what people are saying about our service! Below are reviews Realtors and Homeowners about Lanier Appraisal Service and Mary Thompson as an Appraiser. We Specialize in Lake property but conduct appraisals on ALL Single Family Residential Homes and Vacant Lots. 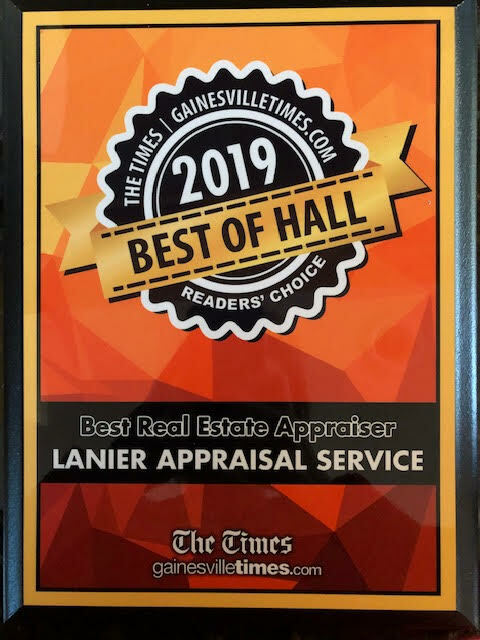 Voted Best Appraiser in Hall County for 2018 & 2019 by local voters. Hey, let me tell you all; Mary Thompson is one of the most professional and nicest people that I have had the pleasure of doing business with in some time. Mary was always prompt to respond; did everything, and I mean everything she promised to do. Also, her work is very impressive to say the least. I can say without a doubt, she is the go to person for property appraisals on Lake Lanier. Mary has helped us greatly with her deep experience and expertise. Thanks!!! We had our home on the market on Lake Lanier for a couple of years and even though we got activity and showings, we never got any offers! Working for the largest multiple listing service in Georgia, I knew the market and what other comparable homes on the lake were selling for but since the value to prices of the homes on Lake Lanier are all over the chart I decided to hire Mary Thompson to do a professional appraisal for us to figure out the right price so we could move our home! From working with Mary I realized that she is not only one of the most professional Appraisers in Georgia she is also very pleasant to do business with! I recommend her highly! We use Mary to help us when we wanted to sell our home on Lake Lanier. We paid for a personal appraisal before listing the home to know the market and the right asking price. We found Mary to be very knowledgeable of the lake. Her appraisal helped us to maximize our Sale Price. We would recommend using Mary. Mary Thompson and Lanier Appraisal Service are the Lake Lanier appraisal experts! I have relied on Mary's professional real estate appraisal service for my own properties as well as my clients'. Her business has a strong Lake Lanier focus and she understands lakefront and land values better than any appraiser I have encountered in the area. She is trusted by many professional real estate agents for providing excellent service, reasonable rates and extraordinary knowledge of property valuations in the Lake Lanier area. 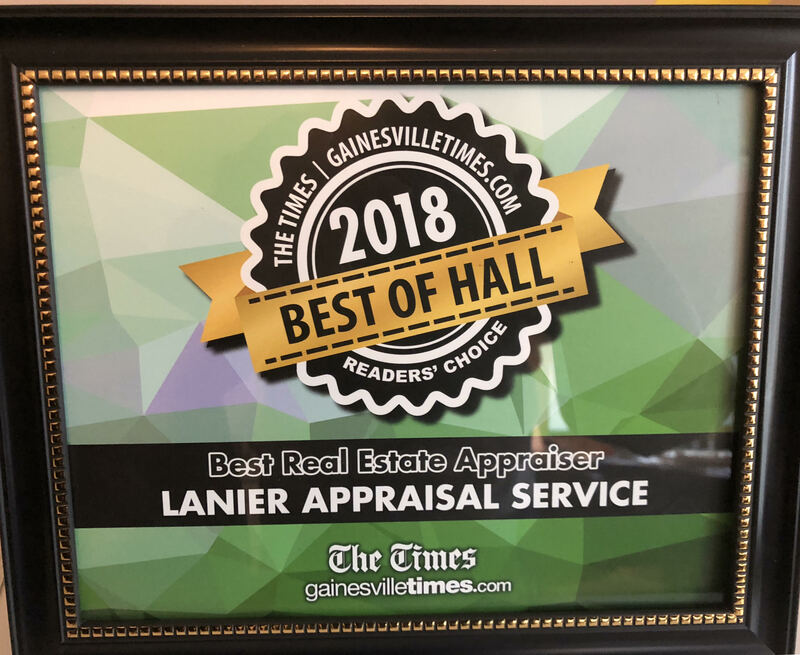 Lanier Appraisal Service is the go-to company for accurate and trustworthy real estate valuations, and we rely on them to provide the very best in real estate appraisal reports and valuation research! Finding an appraiser who is knowledgeable about lake properties is definitely a hit or miss proposition and if you have been around the lake long enough you certainly hear your share of bad experiences. When we decided to sell our lake home, Mary Thompson's name kept coming up as the "go to" person in terms of Lake Lanier appraisals and we certainly could not agree more based on our experience. Not only was Mary prompt, professional, fair and knowledgeable, she was great to work with and provided valuable home marketing advice as well. Her appraisal not only helped us establish an objective and defensible asking price, but it was also invaluable both to us as the sellers and to the buyers during negotiations on the final purchase agreement. We closed on our house last week, having had an incredibly pleasant and smooth transaction, in no small part because Mary helped us establish a fair and reasonable price. We would strongly advise getting an appraisal before marketing your home, especially a lake home given how unique each property tends to be, and you would be hard pressed to find a more skilled and objective appraiser to work with than Mary Thompson and Lanier Appraisal Service. "Mary Thompson was a Godsend to us when we were trying to close a property at Lake Lanier. Our Mortgage Company used their appraiser initially and almost cost us the property. Just 2 days prior to closing our mortgage company finally realized that they needed a Lake Lanier Specialist and called Mary Thompson. Not only was Mary able to give them the real value of the property, but did the appraisal immediately and saved our closing. We are extremely grateful for her. She went beyond the call of duty. She is a professional and friendly and knows her business. As a real estate broker, I will insist that we use Mary for all our future appraisals. Thanks Again, Mary." Olivia Petershagen. We use Mary to help us when we wanted to sell our home on Lake Lanier. We paid for a personal appraisal before listing the home to know the market and the right asking price. We found Mary very knowledgeable of the lake. Her appraisal helped us maximize our Sale Price. We would recommend using Mary.